As a relatively recent graduate and therefore associate member of the Chartered Institute of Public Relations I don’t get a vote in the elections that will decide our professional body’s 2017 president. However, that doesn’t mean I don’t have a view on who should take up that position. It still somewhat irks me that the more junior members of our body have little say in the direction it takes, despite what the CIPR itself was planning a little over a year ago. That being said, the candidate I would vote for – had I the ability to do so – is actively engaging with and listening to the views of practitioners who, like me, are still in the early stages of their PR careers. That candidate is Jason MacKenzie. Professional Bodies: Postnominals & PR Week? What motivates people to join PR’s professional bodies, is it just about postnominals and PR Week? Or is it something more? 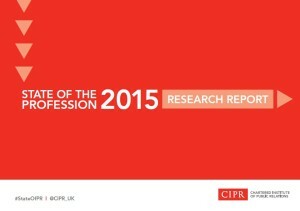 Earlier today the CIPR (Chartered Institute of Public Relations) published its annual State of the Profession report, and it’s not an easy read. I came into the PR course at Leeds Business School with quite a clear idea of where I wanted to be after graduation – working in food and drink PR and in particular with high-end restaurants and drinks brands. However as I approach the end of my second year I’m not so sure that’s still the case. I’ve been on placement with Harrogate-based Different PR since October 2012, typically in the office one or two days per week during term-time and full-time over the summer and other university breaks. I feel I’ve learned an awful lot working at Different PR, the fact that it’s a small agency has been a real benefit I think. Because it’s relatively small I know the team and how they work very well, and unlike placements at larger agencies where smaller, more menial tasks can be the norm, I’ve been allowed to spend the vast majority of my time there really contributing to the work the company does for its clients.